We all set informal / formal goals, whether it’s to get through today’s workout on the elliptical or to have a smooth school year. 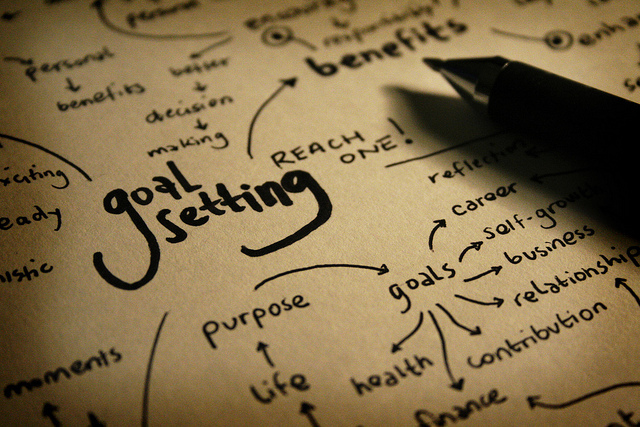 Our goals are usually something we strive for, an end to some type of means. I’ve found that goals change as people change. Goals can be placed into different categories, such as academic, fitness, health, financial …. the list goes on and on. Have you ever made an academic goal? For some, the answer is a hesitant … yes, I think so … to get through graduate school or something like that. Effective educators need to be able to communicate the need for goal setting. Why is goal setting for students important? When students analyze their own data (assessments, homework, class participation, etc.) they often become more interested in the analysis because it’s relevant to them. While reflecting on the data, students have an opportunity to set goals for themselves. Teacher modeling is a vital component of this procedure, although when left to look at their own data, students often make essential connections and can relatively pinpoint where they personally struggle. While introducing the concept of student goal setting, teachers can model from their own lives when they’ve had to overcome a goal. Britt Pumphrey and Jonathan Ferrell’s blog has a few practical visuals that can assist in communicating student goal setting. Students seem to express interest when they see that their own teacher has had to overcome some type of obstacle and it relates to the topic being discussed. After students set their goals, they develop a plan to achieve their goal. The teacher and parents are all aware of the goal and help support the student through this process. By creating goals, students start to take on more responsibility for their own learning. In the example below, new goals are created every 2-3 months. After a general math pre-assessment or assessment, students are given the opportunity to analyze their own data to see which concepts they understand and which concepts need strengthening. A student might observe that most of the problems missed are related to multiplication and division concepts. The student decides that the goal is to improve the efficiency and accuracy of solving multiplication / division problems. The student sets a goal to improve in that specific area. To achieve the goal, the student decides to practice multiplication / division problems twice a week for 20 minutes on the computer and to create and solve two practical word problems a week relating to the goal. When students analyze their own data, they can observe over time that appropriate effort (i.e. practicing computation math problems / creating world problems / other factors) leads to achievement. The students will will also observe that practicing good habits (following through with their action plan) positively affects the outcome of their goal. Educators and administrators set goals and this should be modeled for students. The students that we educate today need to understand the importance of setting goals, and more importantly, how to achieve them. Not only is this academic related, but this is also as skill that will help prepare our students for life outside of the classroom. I’m Tracy Chopek, the college writing intern for Stage of Life. This month we are holding a writing contest about goal setting. High school and college students can share stories about when they have set some type of goal and either succeeded or failed. I saw your blog and wanted to make you aware of our contest in case you are interested in sharing it. The contest is being sponsored by Lenovo. Stage of Life is an international blogging community with over 400,000 students and teachers passing through our site each school year. Please let me know if you have any questions or are able to feature it- thanks!